Kyla: "It Was Nice Of Drake To Give Me That Step Up"
The British artist was on maternity leave and hoping to return to music someday. Then, OVO called. Screenshot from Kyla's 2009 video for "Do You Mind (Crazy Cousinz remix)"
In fact, no one was more surprised than Kyla Reid herself. The singer was just coming out of a break from music that she took to focus on building her family (she now has a two-year-old son with her husband, Errol Reid, aka Paleface—a member of the Crazy Cousinz production collective and original co-writer and producer on “Do You Mind”). Mid-2015, she started considering how she might reignite her career as a vocalist, and began recording new music. Then in early 2016, she was drinking tea at a friend’s house when the call came from Drake’s people. Did you know exactly when “One Dance” was going to drop? No, I didn’t. [Drake’s team] contacted us a couple of weeks ago, just setting everything in motion. To be honest, I really did think it was an April Fools [joke]. I was going along with it, but I was thinking, ‘They keep saying they’re gonna bring it out on Friday [April] 1…’ Then Friday came, and they were like, "We still need to tie up some loose ends." I originally signed the paper deal on the Monday [April 4], and then, I remember saying to Paleface, “Even though we’ve signed that deal, they could still sit on the tune for a while.” And he was like, “Yeah, it might not ever come out.” It’s a horrible feeling. Then, Tuesday [April 5], it went a bit crazy. I hadn’t had time to really think about it, it was just out! How did it feel when the song the public? I didn’t know it was going to happen. I got up Tuesday morning, and I looked on Drake’s [Twitter] page, like a little stalker. With everything going on, I just kept checking. Then I went to the passport office. When I come out of the passport office, my phone was just going mental. It was the most humbling, blessed feeling ever. What were you doing in the passport office? Obviously, we were talking with Drake’s team, and they were saying that they wanted to do a music video. We haven’t really made any proper plans about the video, but I just thought that [Drake’s team] could call me up tomorrow and say, “We’re flying you out to L.A.” And my passport was out of date. So I thought I better get it sorted. What kinds of reactions did you get from the people blowing up your phone? It was really nice, actually, I was getting a lot of people asking me if I knew that Drake had done something with my song. I was getting some really funny messages, some were like, "Did you know Drake’s stolen your tune?" I was like, "No, I know about it! I’ve had to keep quiet for a little while." How long have you known that this has been in the pipeline? I’d only known for a few weeks—and with this industry, I’ve had a lot of situations where things have come along, and you get excited, and then they don’t happen at the last minute. So to be really honest, I was thinking, ‘It’s not gonna happen.’ So, for the past few weeks...I couldn’t eat or sleep. I kept thinking, ‘What if this actually comes out? This could be amazing for my career.’ Especially ‘cause I obviously went away for a little while, after doing “Do You Mind,” to get married and build a family. Tell me about that period out of the limelight. I never really wanted to go away. But I got married, and I fell pregnant pretty quickly after that. I thought I could work until I started showing, but I actually fell really ill. I had an illness called hyperemesis, and I was sick constantly, 24/7, every day for nine months. It just took me out of the game, really. It was quite embarrassing. I stood up on stage once, and halfway through singing I needed to run off the stage, and I threw up at the back of the DJ booth. I knew then that I needed to take some time out, and come back when I was ready to come back, instead of trying to fight [it]. 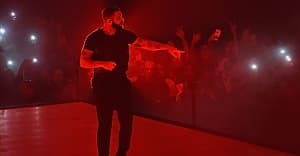 Do you know how Drake came across “Do You Mind” in the first place? I did ask this question actually, and Drake's manager said that they'd been hearing it on their radio station [in Toronto], for like two years, and they always said they wanted to do something with it, so they decided to go and do [it]. I was really blessed. When they contacted us—I was 'round a friend's house, drinking tea, and I got an email from a publishing company like, "You really need to get in contact with Sony.” I just remember thinking, ‘I'm round a friend's so I'll deal with it later.’ Then they actually contacted my father-in-law, so I knew it was quite important. My father-in-law was like, "They're saying that a huge international artist is trying to get hold of you." Paleface phoned up, and then we found out that it was Drake, so that's when I was like, "Something's not quite right here. I think someone's trying to play a joke on us." Normally, you have a call and then they'll say they'll call you next week—but [within a couple of days] they were like, "Yeah, we're gonna sign this, let's do it and let's talk numbers." It happened really quickly. What was the process behind you getting credited as a feature—did you re-record the vocal? I would also say, [Drake]'s very happy to [support] up-and-coming artists, and help people out. [Drake’s team] said to me, "Drake would be really happy to help you boost your career. This would be a really good move." It seems like you might go to number one in the U.K. this week. How would that make you feel? The first time around with "Do You Mind," what do you think made it such a stand-out hit in its genre? A lot of people say to me it was the beat, as well as a sort of soft vocal. I actually recorded it to a bassline track. And then [it] got remixed, obviously, into a funky version, [by] Crazy Cousinz. I remember listening to it and thinking, "This is really different." I had never heard anything like it before. I was thinking, ‘This is really good, but I don't know where you would place it.” [Then] all of a sudden, this funky scene opened up. I remember hearing one of Katy B's tunes in the funky scene as well. The track seems to transcends generations and cultures">speak to different cultures and genres. On “One Dance,” there's a Canadian rapper and a Nigerian artist over the top of a British sound with a British vocalist. It's interesting how that all fuses together. You're right. That's why when they contacted us, I was really intrigued—when we phoned Sony and they said that it was Drake and Wizkid, I was like, "This is a really unusual mix." I couldn't quite see where "Do You Mind" would fit in there, but it's brilliant. I think [it works because] Afrobeat is very similar to funky. It's very similar, so [“One Dance”] was a really clever project. Do you think you’ll make U.K. funky again? I would never say never. I just want to stick with just making what I feel. When we were talking to Drake's camp, and I was trying to find out why he was interested in the tune, they were very much like, "He's very into music and he just wants the music to speak for itself." I'd say that is exactly where I am. I love music, and if I get up and I hear a funky beat and I'm really feeling it, I will write to it, but if I get up the next day and I hear a dubstep beat or an R&B tune, I will write to that too. I've been getting my head down in the studio, even more so now. Since the middle of last year, that's when I decided I need to start building some tunes so I can show people that I'm back. I’ve done a few pop songs. I’m in the studio tonight with a sort of really slow, R&B-ish one. Some house tunes. I’m gonna put out an album...I’m just making a lot of tunes, so that then I can sit down and pick and choose the right ones. I wanna hopefully do a few more collabs. I've been given a really good stepping stone and I just wanna show everybody what I've got. I'm dead excited for the future. If you'd have asked me a few weeks ago, whether this was gonna happen, it was never on the cards. I was still scratching my head and trying to work out how I was gonna come out with a tune and show people what I've got. So I feel dead lucky. You never know what’s gonna happen.